Our pages are updated daily. Order Page Email Us for all your enquiries. Please note that all our prices are quoted in Australian dollars. To quickly convert amounts to other international currencies please follow this link. Write down selected specimens IDs & price then click here! Click any picture to enlarge ! AUD $10 per card of 12 specimens. Write down selected items then use our secure order form! Specimen: Educational Australian Specimens. Specimen: Calcite Beauty. Locality: Australia. Locality: Mersey Valley,Tasmania. 17 cm 7 cm x 6 cm high. Coolrocks proudly present our new product perfect for beginning geologists, home school families and schools. 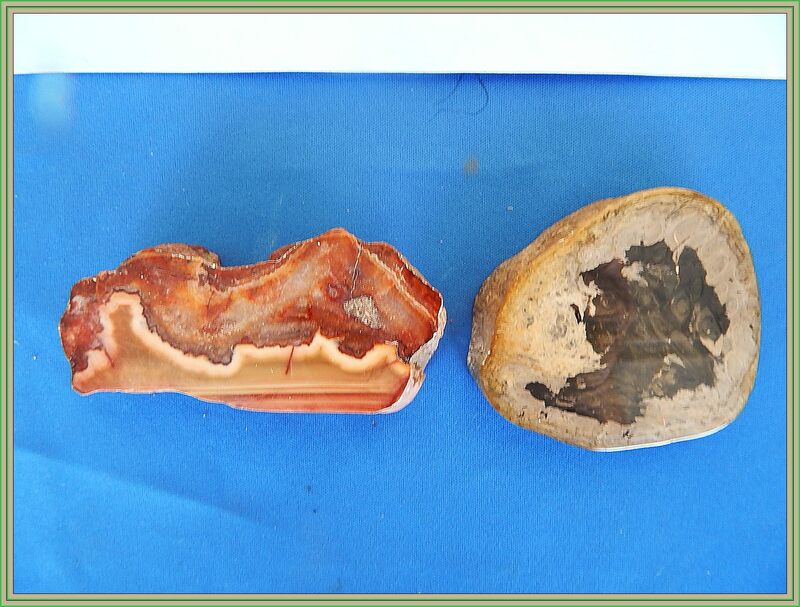 Australian Rocks, the pink card, has a range of Igneous, Sedimentary and Metamorphic rock specimens. 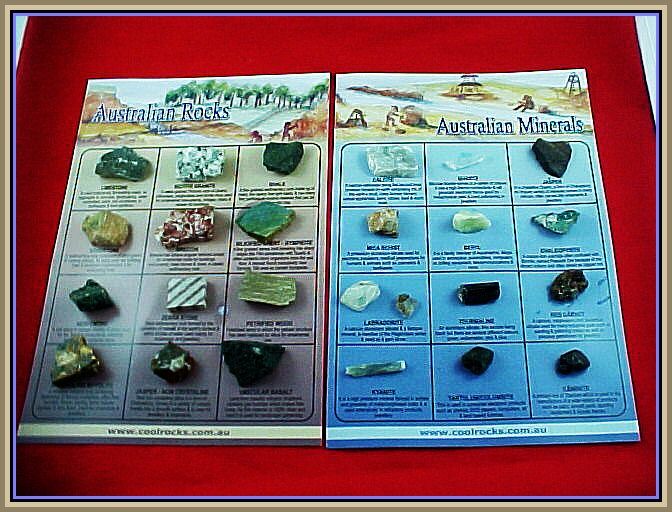 The blue card has a variety of twelve Australian Minerals. Any quantity available! Another beautiful specimen from Tasmania. This again came from the private museum collection. A wonderful display item for any advanced mineral collection. Absolutely perfect and displays jut right. 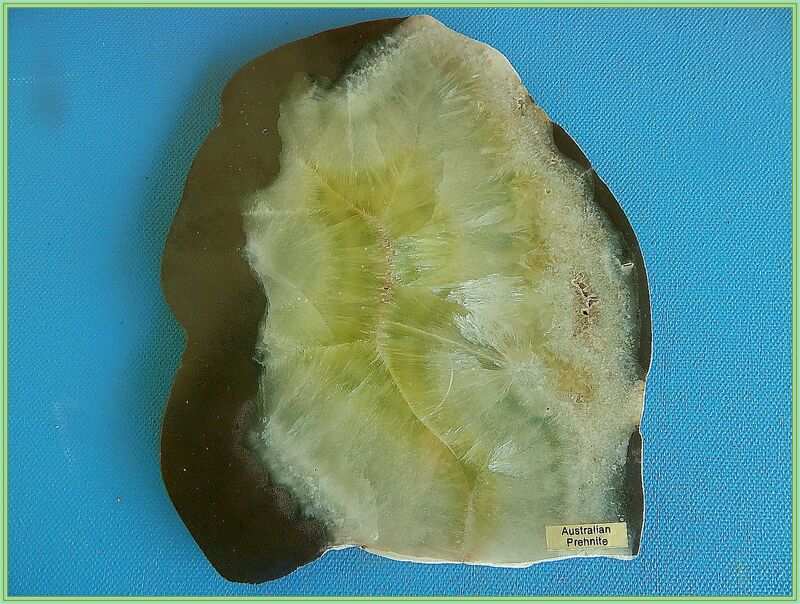 AUD $10 per card of 12 specimens..
Specimen: Educational Australian Mineral Specimens. 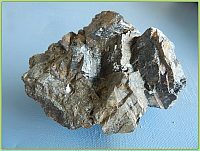 Specimen: Arsenopyrite. Locality: Australia. Locality: Biggenden, Qld, Aust. 23 cm x 15 cm. 11 cm x 7 cm x 5 cm high. Coolrocks proudly present our new product perfect for beginning geologists, home school families and schools. 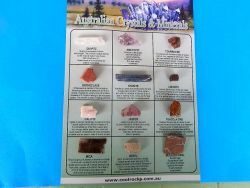 Australian minerals, crystals. Boulder Opal card The card has a range of mineral specimens. 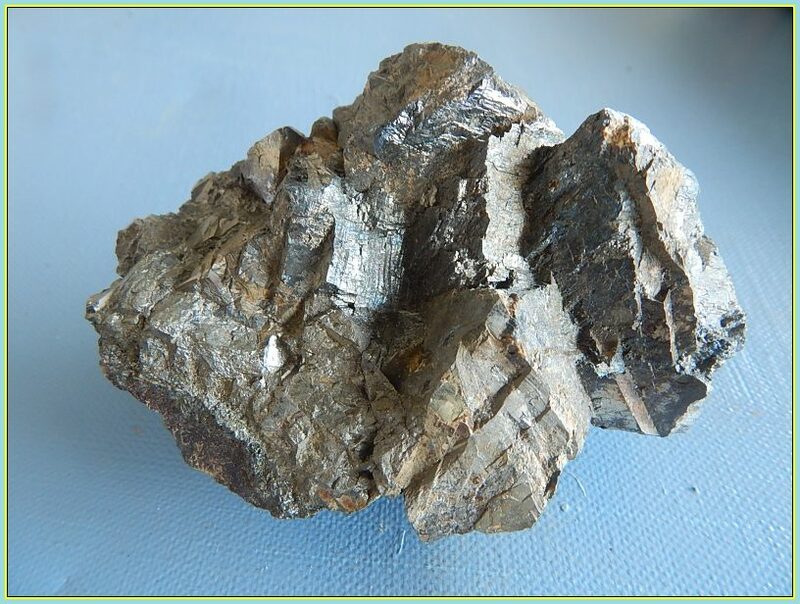 A top class specimen of Arsenopyrite from a mine long since closed. Specimens from this mine are now extremely scarce. Not all that pretty but a real collectors item. Locality: Kununarra.WA. Locality: Wave Hill, Qld. 13 cm x 7 cm x 3 cm. 13 cm x 6.5cm x 4.5 cm x 4 cm. 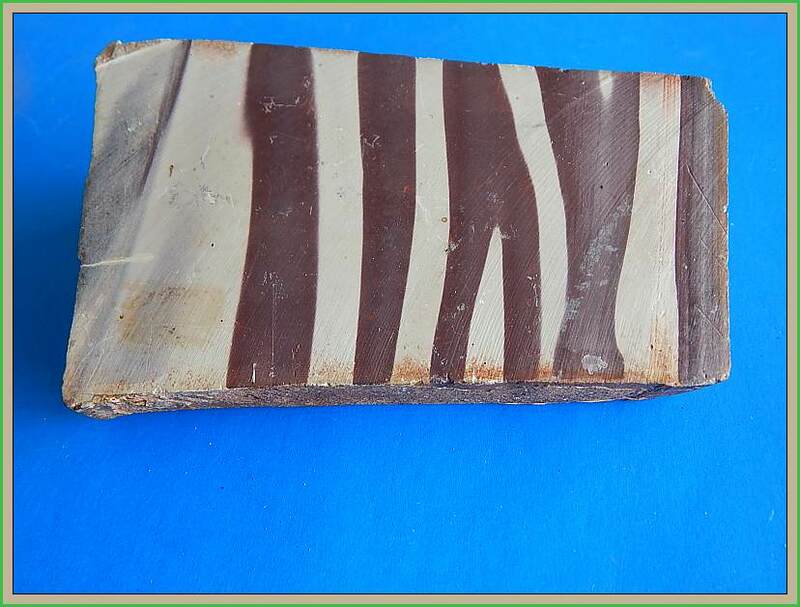 Lovely slab of zebra Stone from WA This has not been polished. Comes straight from the saw. Gorgeous patterns. 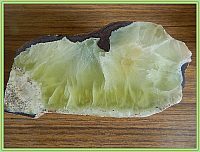 A nice specimen Prehnite from Wave Hill Nt. 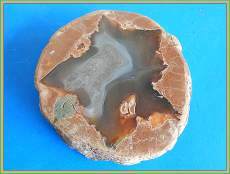 This specimen has been cut and given a high polish. A really good display item.Reverse side a little rough but overall okay. Specimen: Prehnite Display. 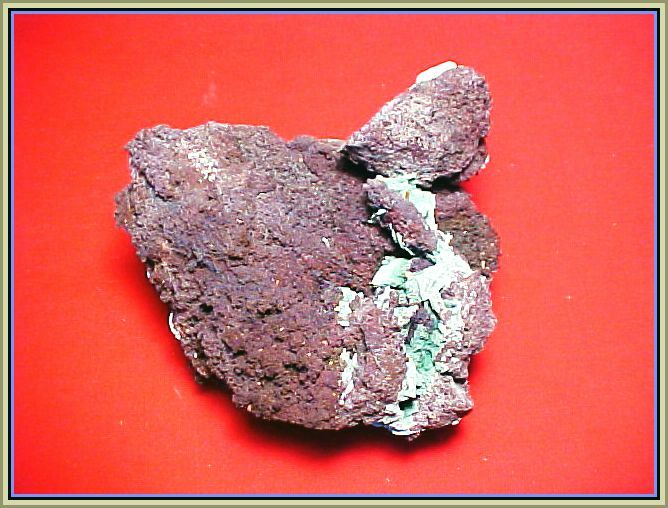 Specimen: Meta Torbenite. 16 cm x14 cm slab. 12 cm x 7 cm x 2 cm. A really beautiful display specimen of highly polished Prehnite. From the N T Aust. and cut and polished at Mt Hay. Absolutely stunning! 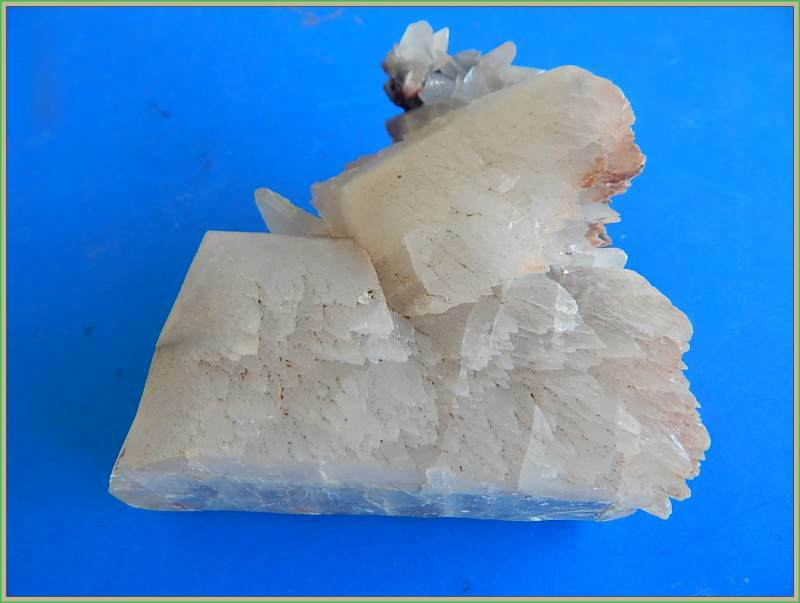 A lovely specimen of a very scarce mineral We purchased this in` an old collection from W A. It was mined at Sadle Ridge open cut NT. Locality: Tambar Springs. NSW. Locality: Kalgoorlie Area,WA. 16 cm x 4 cm x 5 cm high. 8 cm x 6.5 cm x 4 cm. 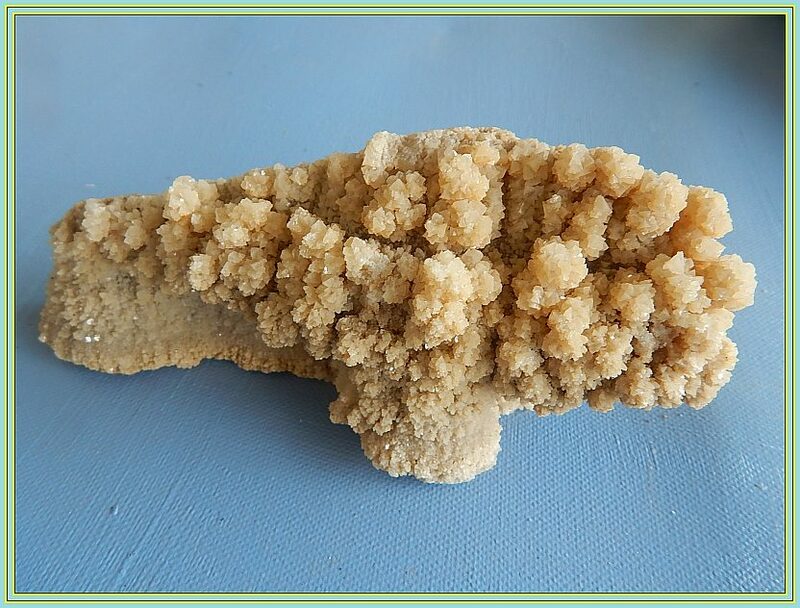 A gorgeous specimen from the Tambar Springs region. Better than picture shows! Has lovely pink crystals with a crown on drusy quartz. A top display specimen to suit any advanced mineral collection. 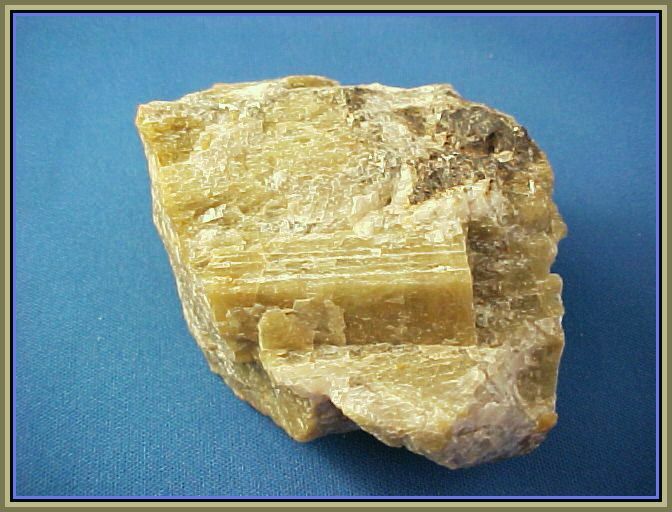 A top specimen of green spodumene. Lithium, Aluminium Silicate. This is a really good sample and will suit any advanced mineral collection. 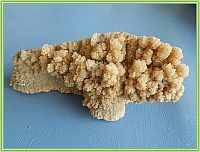 Specimen: Calcite & Heulandite. 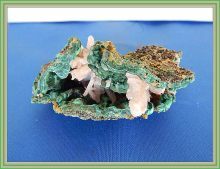 Specimen: Malachite Cave. Locality: Tambar Springs NSW. Locality: Rum Jungle, NT, Aus. 10 cm x 10 cm x 6 cm. 8 cm x 5 cm. A lovely combination of Heulandite crystals. Masses of gorgeous pink crystals on massive clear white Calcite. Perfect condition from an old collection. Not many of these around anymore.Check it out! 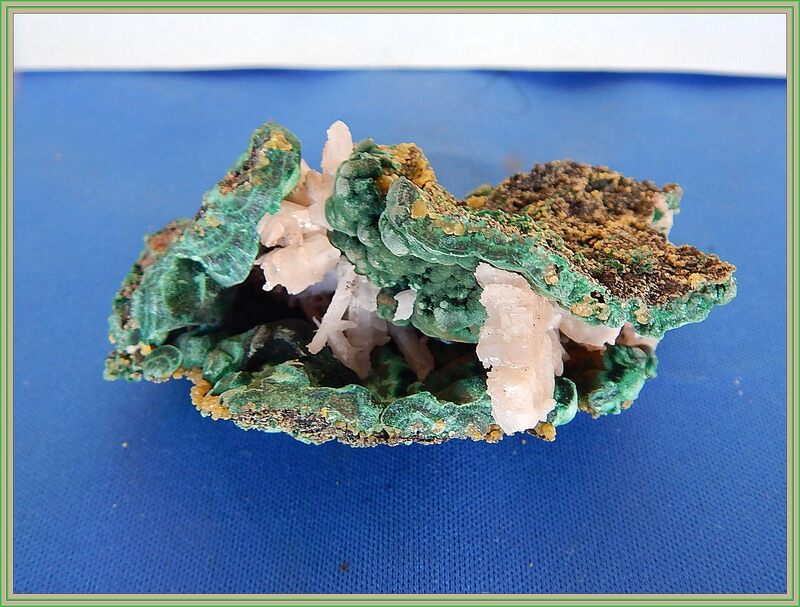 This Malachite specimen has a gorgeous cave with showy white Cerussite crystals as decor.Not huge but a fine specimen indeed.Mined long ago From a private collection. 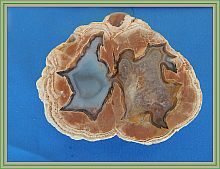 Specimen: Thunder Egg Specimen: Chrysocolla after Azurite. Pseudomorph. Locality: Mt Hay, QLD Locality: Whim Creek Copper Mine, WA. 12 cm x 7.5 cm . 10 cm x 9 cm x 4.5 cm. 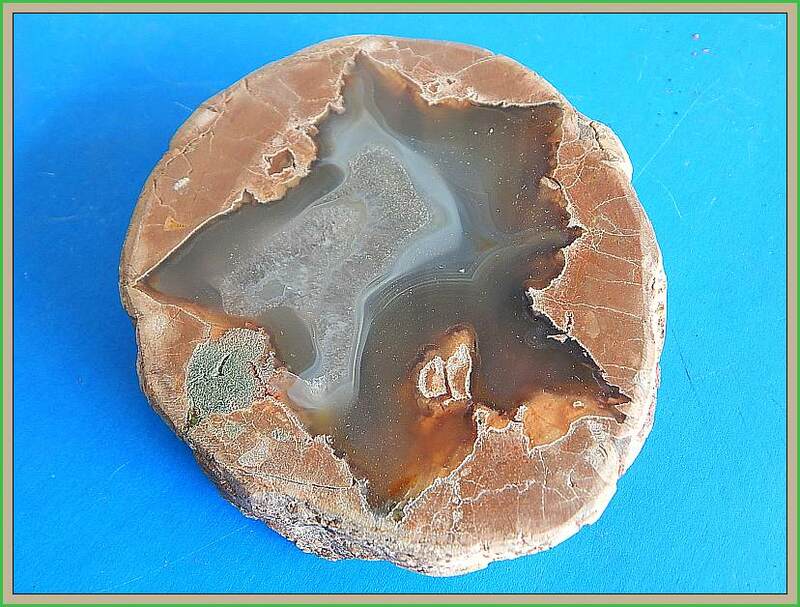 These large Thundereggs are always in demand. This was mined at Mt Hay long time ago, It was cut and given a high polish. Just beautiful. 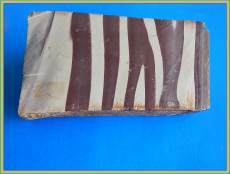 This specimen is from a very old collection and is a marvelous collectors specimen. Pseudomorphs. Chrysocolla replaced the azurite crystals. Mined many years ago. Specimen: Petalite. Specimen: Thunderegg Beauty. Locality: Coolgardie,WA. Locality: Mt Hay, Qld,Aust. 10 cm x 6.5 cm x 4.5 cm. 11 cm x 7 x 3 cm. This is a specimen you'll be proud to have in your mineral collection. 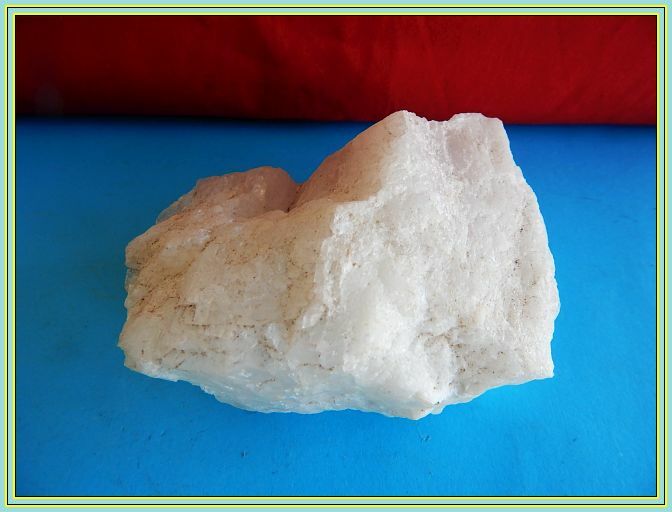 Gorgeous large pure white Petalite. Very few of these are available. This beauty came from a private collection. If you love Thunder eggs than this one is for you. Typical brownish Rhyolite with two striking colourful centres. These size thunder eggs are now very scarce as mine is just not producing anymore. Perfect! 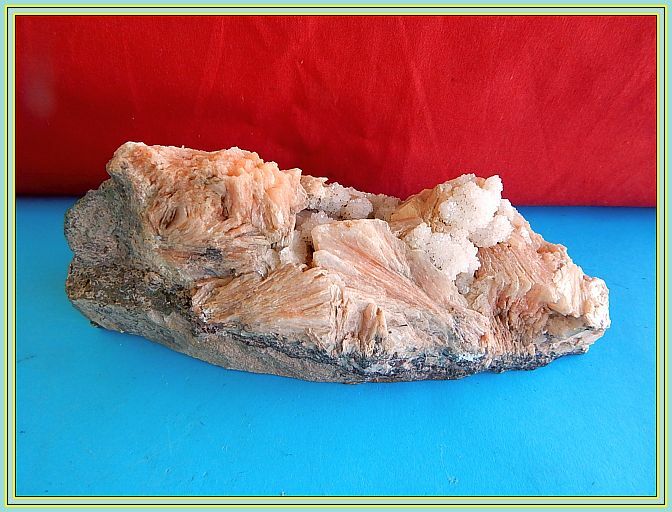 Specimen: calcite Specimen: Thunder egg Display. Locality: Biggenden,Qld Locality: Mt Hay, Qld, Aust. 8 cm x 5.5 cm. 13 cm x 7.5 cm x 4 cm. 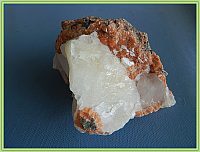 A glorious specimen of Calcite From a mine long since closed This beauty would make a wonderful display item and perfect in every way0r form. A glorious specimen from the Mt Hay thunderegg deposits. The specimen is perfect for display. Check out the small included Hematite near the top. 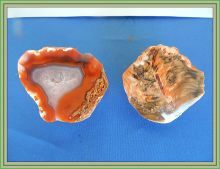 Quartz centre with reddish brown surround. Very nicely polished. Locality: Cloyna & Wandoan,Qld. Locality: Cloyna & Windera Areas, Qld,Aust. 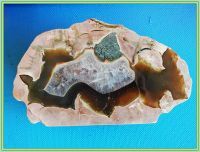 Agate 9cm x 4 cm & Fern 7 cm x 6.5 cm. These are two really beautiful and colourful specimens Both highly polished. 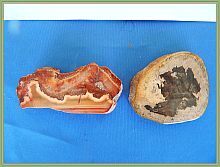 The Agate is a strange reddish colour while the Fossil Fern has a lovely black centre. 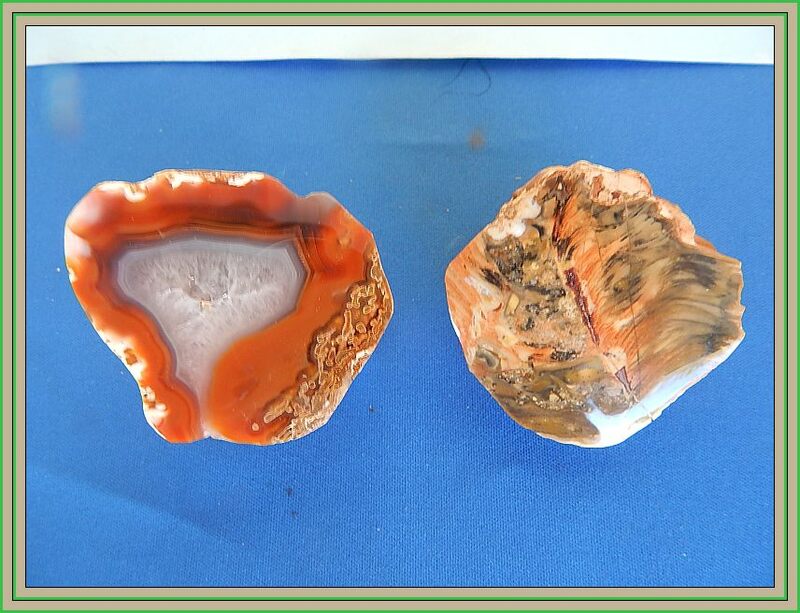 How about these two pretty Agates. Cut and polished to perfection. Gorgeous colours The specimen on right is a real eye opener with strange patterns. Home page Email Us for all your enquiries. New updates on pages daily! BTW, have you hugged your computer today? ©2006 Cooloola Rocks & Minerals.